The landmarked Ganghaus is located in a quiet location. An atmospheric courtyard has created a wonderful courtyard character in the corridor. The house has about 45 square meters of living space on two floors with a small gallery and is comfortable and tastefully decorated. On the ground floor of the house welcomes you immediately an open dining hall with fitted kitchen. The kitchen is made of pine solid wood and is equipped with practical electrical appliances. Large wooden lattice windows bring much brightness into this room. The ground floor also has a modern shower room. The cozy living room with satellite / cable TV and hi-fi is located in the 1st. OG and offers an altromantic view of the courtyard and the neighboring houses in the old charm. In the DG is the bedroom with a small toilet and vanity and shortens the long ways. The floor is exactly like in the 1. OG equipped with light laminate. Classic wooden lattice windows bring a lot of light into the bedroom. The Christmas bazaar at Niederegger in the Breiten Straße 89 offers a large selection of Christmas specialties from Lübeck marzipan. The Kunsthandwerkermarkt in Heiligen-Geist-Hospital, which is well known far beyond Lübeck's borders, is one of the Hanseatic city's most popular pre-Christmas attractions: 30. November to 10. December. The castle monastery as a poorhouse and most important monastery of the Middle Ages in northern Germany. The Günter Grass House in honor of the Nobel laureate in literature, writer and graphic artist. The Holstentor, part of a historic fortification, as a landmark of the Hanseatic city of Lübeck. The Petrikirche with viewing platform and view over Lübeck as a place of cultural events. Lütt Huus: Our holiday home 'Lütt Huus' is a very special house with lots of charm and feel-good character. We rent our house from July 2010 for the first time and have put a lot of effort to make it quite comfortable. You have the possibility to park your car safely during your holiday in Lübeck in the parking garage Falkenstraße, costs: 21 € / week, car park 'Falkenstraße' - Falkenstr. 27, 23564 Lübeck, opening hours: Mon-Fri 7-22h, Sat 7-21h, Sonn- u. Holidays closed. In Lütt Huus a relatively narrow stairs to the bedroom is therefore not really suitable for small children (no fall protection). Tiny characterful house in the middle of the old town. Thoroughly recommended. 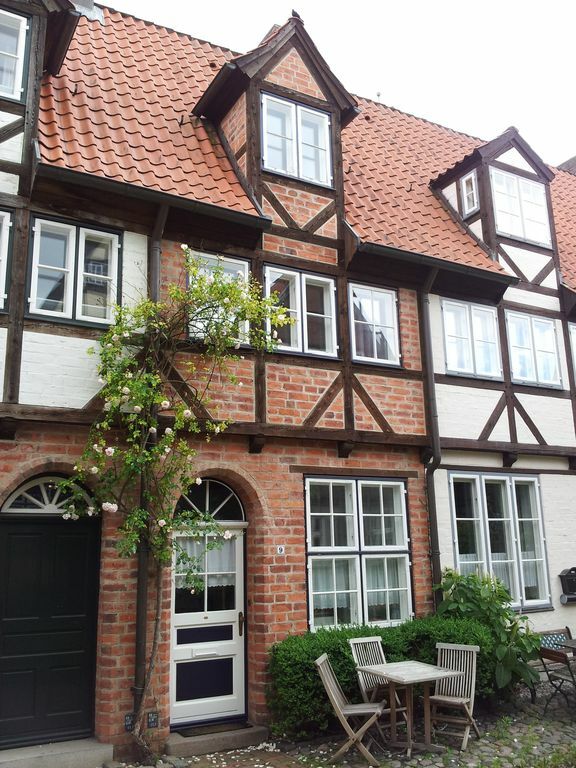 This is a lovely little house within 10 minutes walk of everything that historic Lubeck has to offer. The only reason not to book it would be if you have mobility issues as the three rooms are on 3 floors. We could not have been happier with the standard and location of the accomodation. The Ganghaus is located in the city center of Lübeck in the middle of the old town island with its historic buildings such as. B. the Aegidienkirche, St. Annen Museum with Art Cafe, numerous cultural institutions (Buddenbrook House), restaurants and shops. The pedestrian area is in 5 min. within walking distance. The bathhouse 'Krähenteich'mit large lawn is also nearby. Furthermore, all major transport links, such as the urban transport system can be reached in a few minutes. The highways A1 and A20 ensure a fast connection to the surrounding cities (Hamburg 60 min.) The Baltic coast is also easily accessible (Travemünde by bus in 30 min. ).